From Phys by Kevin Dennehy, Yale Univ. The vast majority of people who fish in the world do so for pleasure, not food. Yet despite the substantial impacts these fishers have on fish populations and aquatic ecosystems worldwide, fishery management approaches still focus on the production of protein rather than quality leisure. A new paper co-led by Yale economist Eli Fenichel argues that policymakers, resource managers, and recreational fishing organizations must recognize the growing role of recreational fishing and the potential pressures it places on fish stocks in order to maintain fishing opportunities now and for the future. Writing in the Proceedings of the National Academy of Sciences, the team of authors suggests that these stakeholders take steps to moderate these increasing impacts, including new management schemes, improved data collection and monitoring, and strategies that better signal to anglers that they are tapping into a common-pool resource. While the authors suggest that recreational fisheries be placed on equal footing with commercial fisheries, the policies need not be draconian or restrictive, Fenichel said. Rather, they suggest more nuanced, locally driven management schemes that allow greater flexibility for fishers in addition to assuring equitable access to fish stocks. "We're not advocating for heavy-handed, command-and-control type regulation," said Fenichel, associate professor at the Yale School of Forestry & Environmental Studies (F&ES). "Rather, we're advocating for systems that better evaluate the complexities of these fisheries, that better communicate concerns about scarcity and costs to fishers and encourages people to consider some of the costs they're imposing on others either today or in the future." "Because if we're not careful about how we allocate resources today, we're potentially allocating them away from our children's opportunities to fish," he added. "So it's really about balancing those needs." For too long, the considerable importance and impacts of recreational fisheries have been ignored. Image credit: Florian Möllers (photographer). 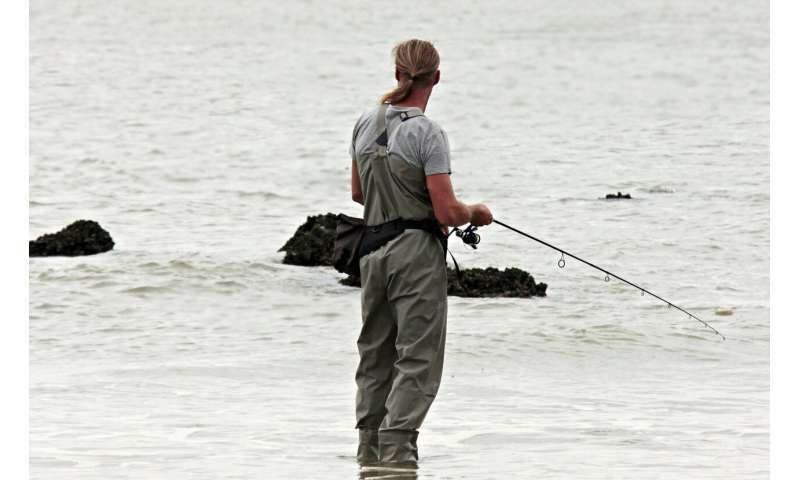 The paper, which was co-authored by an international team of researchers, makes five suggestions for guiding reform of recreational fisheries management: explicitly integrate angling targets into management; involve angling organizations; tailor management to local conditions; use the right tools and provide signals of scarcity; and improve monitoring. About one in 10 individuals in the world's industrialized nations—or about 200 million people—are recreational fishers, researchers say. That's about five times the number of commercial fishers worldwide. There's a common perception that these recreational fishers have lower impacts on fish stocks and ecosystems than commercial fishers, the authors write. And while this might be the case on a global scale for some impacts, there are growing concerns about the environmental impacts of modern day recreational fishers. The typical recreational fishery requires individual anglers to purchase an annual license with moderate fishing constraints such as the length of season, the number of fish kept a day, or the types of gear used. According to the authors, this sends a signal to individuals that there's no direct benefit in limiting their overall fish intake. Also, these annual licensing policies offer no disincentives for increased fish mortality, crowded fishing sites, or hook-and-release practices that can have significant costs on a fishery. Indeed, with advances in technology and the growth in tourism-related fishing, researchers say recreational fishers are pulling a growing percentage of fish from waters in coastal areas and inland regions that have historically been dominated by commercial fishers. This has caused fish populations to diminish in many places; in some places they are causing population "collapses." There are five essential tenets of policy reform for sustainable recreational fisheries (outer ring). And there are several supposed impacts on angler and manager incentives (inner ring). Recreational fisheries are quite diverse in terms of their motives, habitats, and impacts (center image). Image credit: Sign Art Studio. A key challenge in accounting for these impacts is that fishing regulations typically discount the complex factors that motivate recreational fishing, Fenichel says. A stubborn myth persists that when policymakers manage recreational fishing they're managing a food source. "But in truth," he says, "most of these fishers are fishing for fun, they're fishing for leisure, and that should play into how we manage these fisheries." "For example, we shouldn't use dated concepts of 'maximum sustained yield' [the maximum level at which stocks can be exploited without long term depletion]. That may be important if your goal is to put protein on the table, but it's not clear that that's what most recreational fishers want." Part of the problem is that there's a diverse range of recreational fishers, he said. Some prefer to catch a lot of fish, while others might want to catch one really big fish. Others might enjoy being out on the water with a group of friends, while others simply want few hours of solitude in nature. And while some might be able to join expensive charter trips whenever they please, there are others who are limited to finding a few weekend hours and might therefore have minimal opportunities to fish, Fenichel said. "So we need to manage these fish resource to provide for this diversity. And it's not about providing protein." In the paper, the authors suggest that recreational fisheries move away from "one-size-fits-all" regulations and toward policies and regulations that "unleash virtuous incentives among a vastly more numerous population of highly diverse people." They also suggest that angler organizations should be more involved in promoting more responsible management processes and monitoring. In fact, they recommend that in some cases local angler organizations be given some management sovereignty. They argue that a single management approach doesn't always work for a fishery, particularly in the face of many different types of recreational fishing. In regions characterized by multiple freshwater lakes, for instance, they suggest allowing managers the flexibility to develop different areas for differing fishing experiences—such as by varying harvest regulations, fishing access, and the size of stocked fish. This, they write, would enable anglers to choose regional fishing opportunities that best match their preferences. Finally, they say there's a need for a management system that sends a clear message to anglers that they're using a common resource that is "depletable by the anglers' use" and that fish are a resource that must receive investment to safeguard sustainability. Robust data collection and monitoring, they say, is needed in hundreds of thousands of ecosystems—and must be communicated with stakeholders to evaluate policy effectiveness and social-ecological outcomes. "Ultimately it comes down to recognizing that we're using these resources for important leisure time activities, that different people define a good leisure experience differently, but that many use fish in their leisure," Fenichel said. "And we have to find ways to share so that everyone can use the fish and use them sustainably."